Since the General Agreement on Trade in Services (GATS) was created in 1995, there has been international pressure towards the liberalization of education all over the world, as well as new challenges to the traditional internationalization rationale in the field of higher education. Nevertheless, education liberalization under the GATS is also a contested process. Public universities, teachers unions, development NGOs and other education stakeholders have opposed and campaigned against the GATS in different countries and at a range of levels from local to global. Based on intensive fieldwork in the WTO headquarters and on two case studies (Argentina and Chile), Antoni Verger opens the black-box of the GATS negotiations in the field of education. His well-documented work explores in-depth how domestic actors and interests are key to understanding the constitution of the global education liberalization process entailed by the GATS as well as the opposition to this process in certain places. 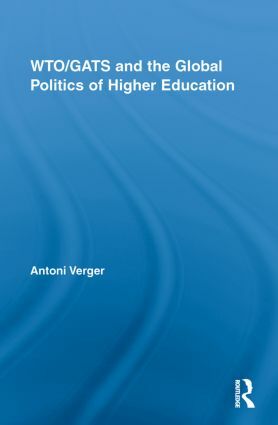 This book is crucial reading to anyone with an interest in the future of higher education.